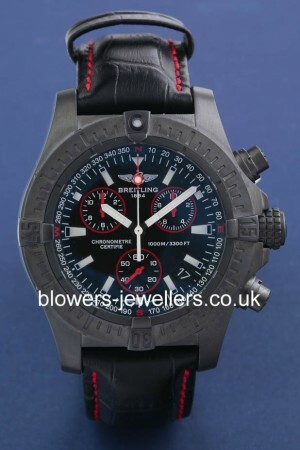 Steel Breitling Avenger Seawolf Chrono M73390. Limited edition of 2,000. Case diameter 45.4mm water resistant to 1000 meters. Breitling 73 Quartz movement. Steel case with black PVD coating. Black dial with luminescent baton hour markers, date display between the 4 and 5 o’clock position. Black steel uni-directional bezel. Sapphire crystal glass. Black croc leather strap with with red stitching black steel folding clasp. Comes with additional black rubber strap.Box and papers dated April 2010. Our reference S18223. SKU: 3048083. Categories: Avenger, Breitling.